We’re on day 8 of Ramadan and slowly but surely, I’ve been cooking through my family’s favourite foods list. I am not going crazy, because that would defeat purpose of this month, but since my children fast I like to make something special for them. On days that I make something elaborate for Iftar (the small meal we break our fast with), I make a simple dinner, like a hearty soup with some fresh bakery bread (we have some amazing organic bakeries in Denver). On days that we break our fast with just some dates and fruit, I make a bigger dinner. Last night we had one of my husband’s favourite dinners, chicken enchiladas. Our Iftar was mangoes, sweet figs and grapes with a few leftover samosas (recipe coming up soon). These Shami Kebabs are found in many countries. They are popular in Iran and chances are that’s how they made their way to India. Indian cuisine has a lot of Persian influence and these kebabs made of ground meat and lentils are popular in India and Iran. Pakistan and Bangladesh also have similar kebabs in their cuisine also. I ate these often growing up and they are some of my favourite kebabs. They are very versatile and can be eaten at breakfast with some hot parathas, lunch time with some rice and daal, dinner time as part of a multi course meal and as a snack or appetiser. Before Ramadan starts, I like to make a batch and stick it the freezer for suhoor or an easy dinner. I love these kebabs with parathas for our morning meal before the fast starts. They have a unique flavour and are unlike any kebab; the lentils and the warm spices are what set these apart. They are a bit time consuming but if you are going to make them, make a big batch and freeze some for later. They make the perfect snack. 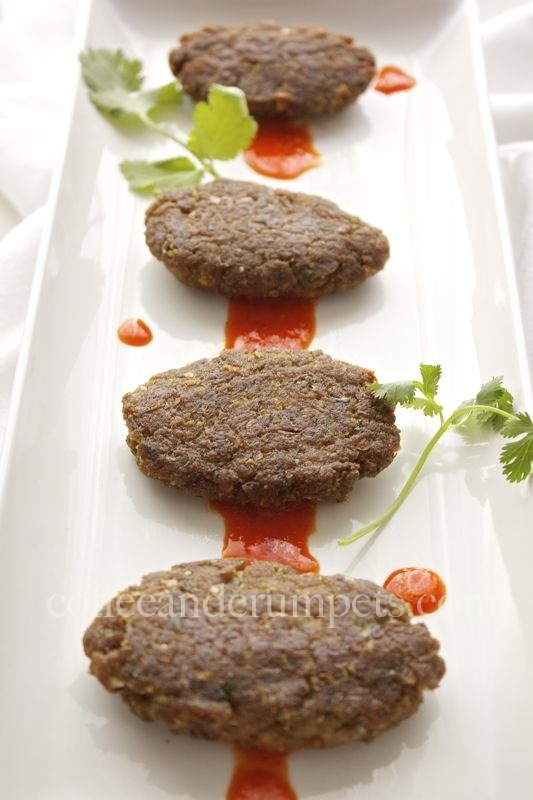 There are many recipes for Shami Kebab out there and some use ground meat and some use meat cubes or even bone in meat. 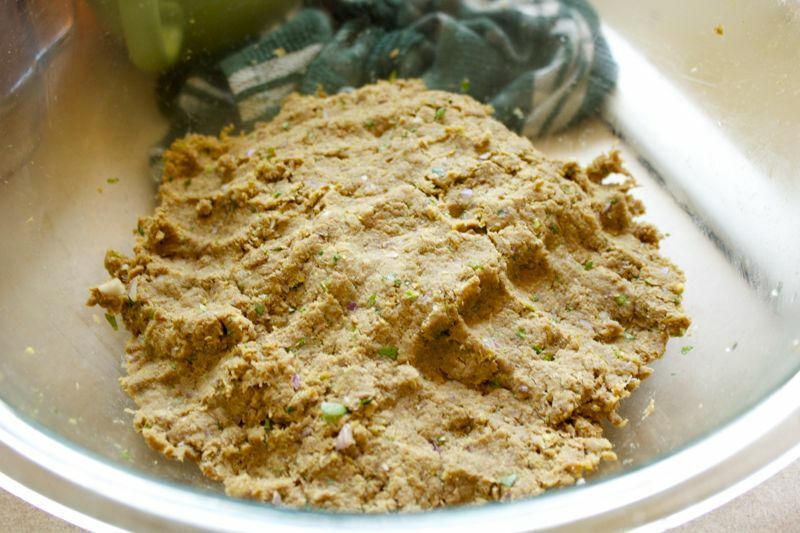 The meat is boiled with spices until it is very tender, shredded or minced and then mixed with the cooked lentils, some red onions, cilantro and green chillies and formed into patties and fried. I don’t like the ground meat version because I don’t like the texture of the resulting kebabs. I prefer the meat cubes and love the texture of the chewy, slightly stringy meat patties. I have fond memories of my mother making Shami Kebabs by hand using her very large mortar and pestle. She would grind the meat on the stone and then mash the lentils and mix it all together. 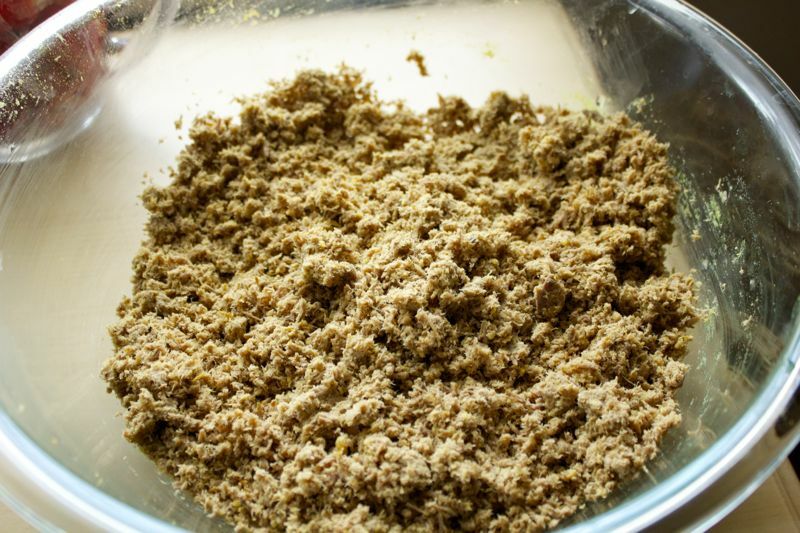 When we moved to England, she swapped her huge mortar and pestle for a food processor. I was thinking the other day how I had not made Shami Kebab since last Ramadan because I broke my food processor last year. It’s amazing how we rely on technology when my mother was quite able to deliver luscious, perfect little patties for us made totally by hand. I finally replaced my food processor couple of weeks ago and I am like a kid in a candy store again, whizzing this, puréeing that and so on. If you’ve never tried these kebabs, you must make them at least once or try them at an Indian restaurant or a Persian restaurant (will be a bit different here because of the spices). They will be good but not as good as what you can make at home, of course. Hope you are all having an amazing week so far. I think I have caught up with my blog reading and commenting and hope to keep on schedule with visiting everyone’s sites. It’s been a tough week for me! The early mornings and late night are taking their toll. Last night I came back for the Islamic Centre after midnight and since we had to eat before 4 am, I just decided to stay awake until then. At 2.30 in the morning my girls wanted to make pancakes so I barked out instructions from the family room and they made pancakes. Then I got up and made home made syrup because they don’t like maple. I didn’t realise I could do all that at 3 o’clock in the morning! The energy, support and the adrenaline you have during Ramadan is unlike any other month. Nazneen, these look absolutely fantastic. Love kebabs of any kind and had it several times at my friend’s but never attempted them myself. I am sure you are having a healthy Ramadan! It must be wonderful feasting after fasting. The shami kebabs look so delicious and perfectly done. It’s hard to eat actually after no eating all day. Your stomach shrinks so you don’t really feast much at all. Still nice to make some treats for the kids. In school, we used to have fairs, and one of my classmates brought shammi kababs to sell. Every single year that we were in school. Her kababs were the best that I ever tasted, and so long after, today these reminded me of her. Thank you Nazneen for sharing the recipe. I am going to make these. Do you know if we could replace it with goat meat? Or does it have to be beef? Awww! Thank you for sharing the story. 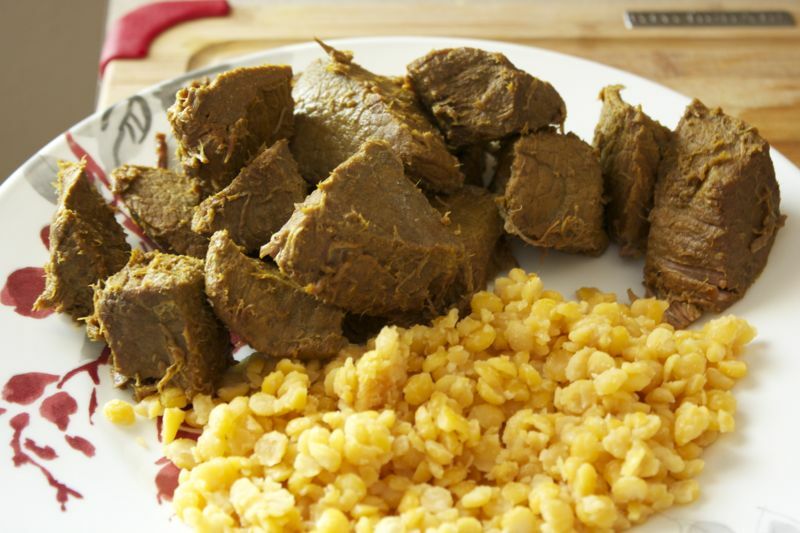 I am so happy these being back happy memories for you, you can most definitely use goat meat, that’s what my aunts use. I may use beef because I don’t like goat as much and find it tricky to manoeuvre all the bones! Oh wow. There is no way I could stay up that late, even if there was a promise of 3am pancakes! And no doubt, my instructions would have been incoherent and unfollowable! You did very well! Jas@AbsolutelyJas recently posted..Why the Poos? You make me laugh Jasmine! I was quite tired though. But I did it again the other day…no pancakes though. Lovely, warm, beautiful pictures made my day. Ramadanul Mubarak ! Hi Nazneen, these look so cute! Totally agree though – we rely so much on technology… take hummus for example. People have been making it without food processors for years but I don’t know what I’d do if I didn’t have one, lol! Thanks Charles! I am getting way lazy in my old age, if it seems like a lot of work, I don’t do it! I don’t what I’d do without my mixer and food processor! Sleep or lack thereof, is the hardest part of fasting. And yes, when Ramadan falls in the winter, it’s really easy! But that was a few years back now and we are back in the summer months. We take our appliances for granted, and I honestly don’t think I would cook a partucluar dish if I had to do it the old fashioned way! Thanks Dixya! Fasting is going well thank you and yes, try these with chicken, I made them with chicken for my father who doesn’t eat too much red meat and they turned out well. Looks super. I absolutely love the presentation of these! Thanks Miss Messy!! I was having a hard time thinking how to plate them but then just ended up doing this! I know what you mean! I also tend to put them on the back burner because they require effort. So worth it in the end though! Fasting is going well alhamdulillah, hope yours is too. Thanks for stopping by! Hi Nazneen! My boss fasts for Ramadan and honestly, I admire her very much. She is so dedicated. She gets up at 3:30 am to eat breakfast and here in the east coast, the sun doesn’t often set till 9pm! I think if I were fasting, I’d make every meal so special during this time. Like these kebabs. They look amazing and such a beautiful array of spices you’ve used! Thank you Anne! We try to make meals special without being too indulgent because we fast to feel the pinch, but if we over indulge, we miss the point. But it is a holiday for us so we do make it special. I love how you have plated the kebabs… It looks like something that a professional chef would do. Great job, Nazneen! I am sure that they taste amazing. In addition, food that brings great memories is the best, aren’t it? Thanks Denise and yes, memories and food go hand in hand. Love these, Nazneen, I’ve not made them yet this Ramadan. Like you, I have a list of foods to make, old & new! My first two are fasting with me, they’re 12 & 9. The little ones are doing half days. It’s so much fun now that the kids are fasting too. Got a question, I use mince for this, why do you use cubes of beef? Thats so nice your kids are fasting with you! It does make things more fun. I hope they are not too long for them. Traditionally these were made with meat chunks and cooked really tender and then formed into patties. The mince ones came along as a shortcut. My mother never made mince ones and I too prefer the ones made with beef chunks. There is a slight texture difference between the two. You know I am wondering how you are posting all my favourite recipes in a row. I remember these kebabs being made on any or every special occasion by my Mom, even today. I will be visiting them shortly and these were on the top of my list of dishes I conveyed I wanted her to make. I am filled with awe Nazneen, at how you are able to fast and cook such a fancy fare late in the night. Mouthwatering pictures as always! Thats what I love about them exactly! They are soft inside and crispy outside. Thank you for stopping by Laura! 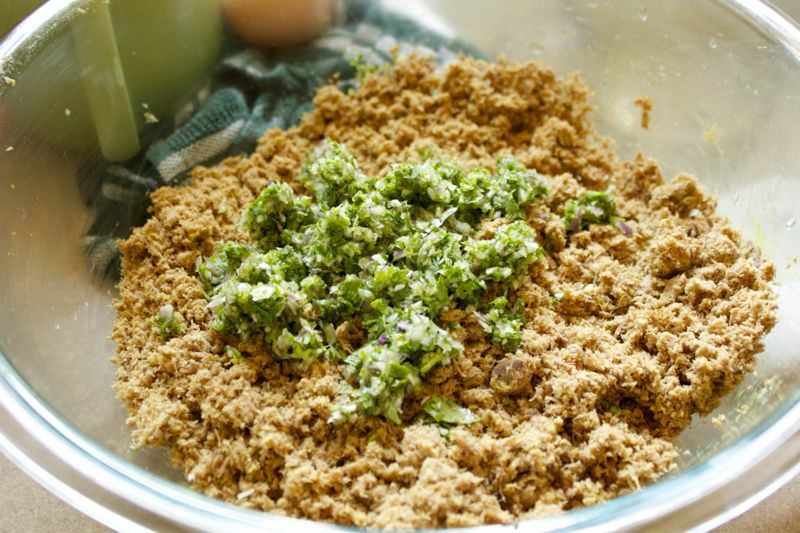 Such an interesting recipe to use with minced meat. Obviously a great favourite with those knowledgeable of Mid-Eastern cuisines. Like the spice mix and shall certainly try. Now, why are these called ‘kebabs’ when they do look on photo more like meat patties rather than something one would cook ‘on a skewer’? In India and other countries in the ME and Pakistan, Afghanistan kebabs are not always skewered but can come in patty or sausage form. The word ‘kebab’ is derived from the Arabic to fry or burn, so in that sense kebabs can cover a variety of fried meat dishes. Most of the time the kebab designation covers meat cooked on its own without gravies etc, and most of the time on an open fire. In India we have quite a few kebabs that are not skewered. Now Shish kebabs are always skewered because a “Shish” is a skewer. Hope that makes sense? Thank you SO much for the explanation. I am certain I was not the only one here to learn from it!! And yes it does make complete sense 🙂 ! You are most welcome Eha! Any time my friend. Shami kebabs are some of our favorites from the first year or two of marriage, and somehow they got out of rotation in our house. Maybe because kids don’t like the spiciness. But that is silly because we still make all sorts of spicy things and just give the kids the plain stuff. I’ll give yours a spin one day soon since summer camp ended today! yay! love to you and family. I did, I was exhausted too. It was so late after we came back from tarawih that I didn’t want to sleep and then feel awful come 2.30 so I stayed awake. And then made syrup. See you soon iA. Thanks GG. Regular cumin is lighter in colour and a bit thicker in size, the shah zeera is black and thinner, but looks like cumin in shape and size. The taste is quite different though. Both have quite distinct but different taste and smell. The Indian stores will have it just make sure and ask for shah zeera. The texture and color of those shami kebabs are amazing. Great work! Thanks Nik! Thanks for stopping by! Nice to know your kids are fasting too. This is a perfectly spiced and simple dish to create, looks tasty. Thanks Asha, yes, they are fasting too except for the little one. It’s quite a fun thing in the morning. Hope the fasting is going well! 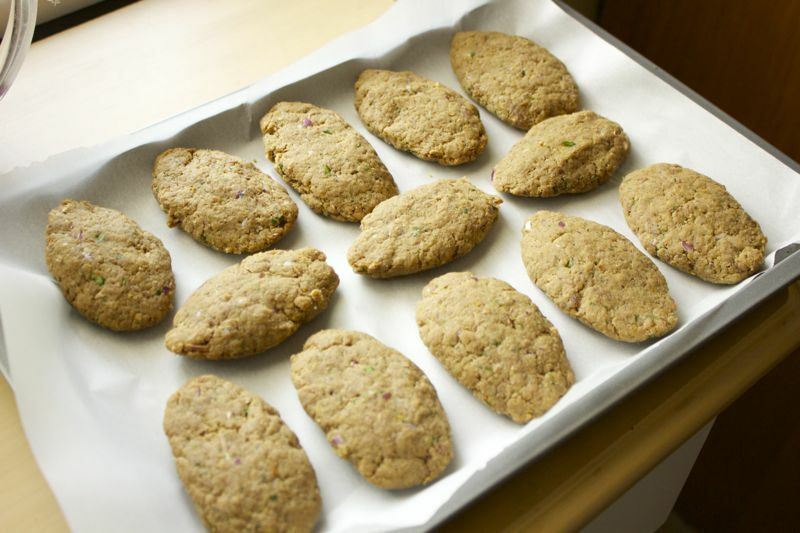 I love shami kababs and usually have some in the freezer through out the year for easy snack or a meal. I like how versatile the kababs can be. Never used mutton for these. I love Shami Kebabs too but I don’t make them enough. The girls stay up until suhoor so they have plenty of time to think about what they want to eat! They are on break so I let them. It looks delicious and soft, great recipe!